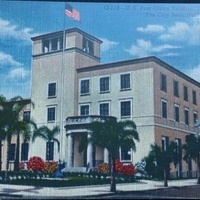 A postcard displaying a drawing of the new Downtown Orlando Post Office building, located at 51 East Jefferson Street in Downtown Orlando, Florida. The post office was built and finished in 1941 as a result of funding provided by the federal government. The land it was built upon had formerly been the site of a Catholic school, but was sold during the Great Depression. The post office building, after debuting in 1941, served Downtown dutifully through the middle of the 20th century in numerous capacities. It served as a post office, a courthouse, and a base for the United States Marshals Service (USMS), as well as several important roles in government adjudication at a federal and local level. In 1989, the Federal Building at Jefferson Street was declared a landmark in the city of Orlando. Original color postcard: Orlando Remembered Exhibit, Downtown Orlando Post Office, Downtown Orlando, Florida. Digital reproduction of original color postcard. Orlando Remembered Exhibit, Downtown Orlando Post Office, Downtown Orlando, Florida. Copyright to this resource is held by Orlando Remembered and is provided here by RICHES of Central Florida for educational purposes only. "Federal Building - Orlando FL - Living New Deal." Living New Deal. April 18, 2015. Accessed October 27, 2015. http://livingnewdeal.org/projects/federal-building-orlando-fl/. Dickinson, Joy Wallace. "Church Comes Full Circle With Its Post Office Deal." The Orlando Sentinel, September 2, 2001. Accessed October 11, 2015. http://articles.orlandosentinel.com/2001-09-02/news/0108310478_1_catholic-school-james-church-church-property. “U.S. 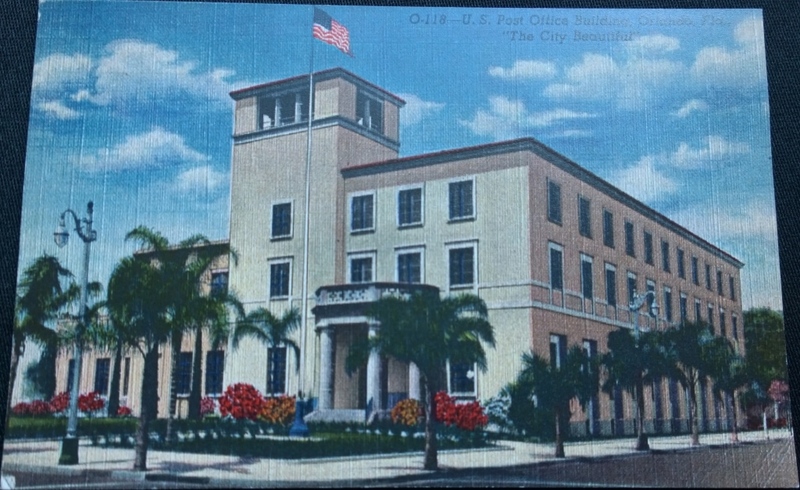 Post Office Building Postcard.” RICHES of Central Florida accessed April 24, 2019, https://richesmi.cah.ucf.edu/omeka/items/show/5596.